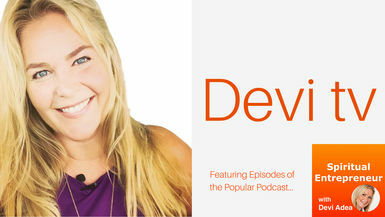 In this episode, Devi chats with David Hayward about David's journey from pastor to blogger and cartoonist and how to manifest your inner freedom, outwardly. David left the professional paid clergy after almost 30 years of ministry and has created a successful career as a cartoonist, writer, and blogger of the well-known blog, the nakedpastor. And, in case you are wondering - "the Naked Pastor" does, in fact, wear clothes. It is not about being physically naked, but rather being fully seen for who you are. David is passionate about how people can find and follow their own spiritual path with courage and joy, as well as in how people can freely gather and form community in healthy ways. David Hayward is the founder of the Naked Pastor blog and has over 30 years professional pastoral experience. David was baptized Anglican as a baby, came to faith in a Baptist church when he was a teenager, changed to Pentecostal in his late teens, married another Pentecostal named Lisa, was ordained Presbyterian, pastored a Vineyard church, went Independent, and planted others.